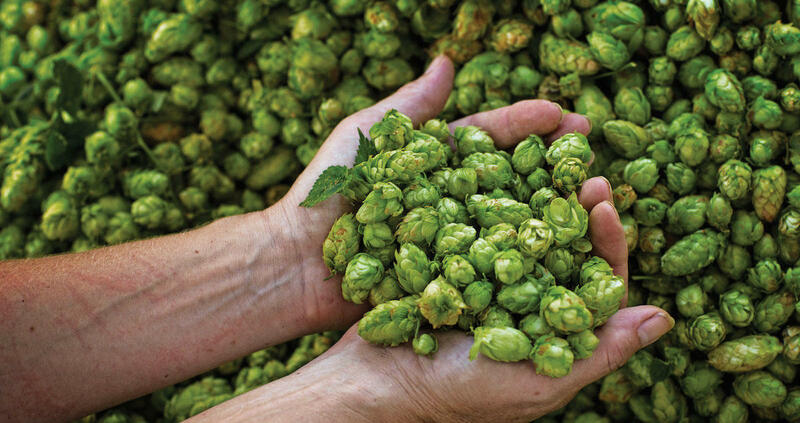 For growers around the world, the humble hops cone isn’t simply a vital ingredient in beer. It’s a livelihood. Every year in late summer, a centuries-old ritual takes place on farms from Washington’s Yakima valley to the Hallertau region of Bavaria. Hops growers pull soaring green bines from row after row of trellis and heap them into large piles on trucks that will carry them away to processing facilities. There, the hops cones will be picked, dried, and packaged before finding their way to breweries and, ultimately, into your favorite beer. Hops thrive in two geographic bands that fall roughly between the 35th and 50th parallels on either side of the equator. The vast majority is grown in the United States and Europe, which collectively account for about 90 percent of worldwide production by weight. And although virtually all American hops come from Washington, Oregon, and Idaho, small farms can be found in many states. Other global producers include China, Australia, South Africa, and New Zealand. Southern hemisphere hops, from New Zealand in particular, have gained popularity in recent years thanks to distinctive varieties such as Nelson Sauvin, Motueka, and Pacific Jade. In 2013, more than 35,000 acres of farmland in the United States (that’s about 26,500 football fields) produced more than 69 million pounds of hops valued at $250 million. Surprisingly, about two thirds of that crop was destined for overseas markets. Clearly, hops are big business, both in the United States and abroad. More than 90 percent of craft breweries contract for hops in advance. In doing so, brewers commit to purchasing firm quantities of specific varieties for several years in the future, and growers agree to plant sufficient crops to meet that need. Contracting lets breweries secure a guaranteed supply of hops, especially those varieties critical to flagship beers, and it enables growers to forecast needs over long periods of time. On the other hand, homebrewers and small startup breweries often purchase hops on what’s known as the spot market. This market is really just whatever remains after the contracted hops have been set aside from that year’s harvest. In the event of a hops shortage, such as the ones of 2007 and 2008, demand for hops on the spot market can boost prices to many times those of a normal year, forcing some craft brewers to reformulate recipes to get by with what’s available. The private developers of these varieties control production and supply by imposing licensing agreements in which growers and brokers agree to pay royalties for access to these plants. And because these are some of the most sought-after hops in craft brewing today, they are priced accordingly. But not all hops are sold in this fashion. Family-owned High Hops, for example, grows more than fifty varieties on its small farm in Windsor, Colorado. With fewer than three acres of land, the farm’s annual yield is easily counted in the hundreds of pounds. But High Hops’s Dave Eischeid maintains that the farm’s small size engenders a close connection with the local community. For example, High Hops hosts a harvest party every autumn, and enthusiasts from around Northern Colorado come to hand pick hops cones. Most of the hops are sold to homebrewers because the quantity harvested simply doesn’t leave enough for commercial brewers (the farm’s own High Hops Brewery notwithstanding). It doesn’t get much more local than that. And given the growing interest in the farm-to-table provenance of the foods we consume, it seems likely that small ventures such as High Hops will become more relevant, even as proprietary hops varieties continue to command premium prices. My very first batch of homebrew was a British pale-ale kit that included one ounce each of Willamette and Fuggle. These are perfect for a traditional English bitter, but they seem tame and one-dimensional, even downright boring, next to today’s high-alpha flavor kaleidoscopes. (For the uninitiated, “alpha” is shorthand for “alpha acid,” the component of hops that produces bitterness.) Today’s craft consumers demand hops that are loud, boisterous, and bold. This is apparent in the success of such unapologetically hoppy beers as Russian River’s Pliny the Elder, Bell’s Hopslam, Three Floyds’ Zombie Dust, and The Alchemist’s Heady Topper. Brewers recognize that modern craft beer consumers want flavors that are bold and intriguing. Keep up with the latest trends in craft beer and homebrewing with a subscription to Craft Beer & Brewing Magazine®. At Puterbaugh, which sells to both pros and hobbyists, the most popular varieties are currently Citra, Amarillo, Centennial, Cascade, and Belma (a variety exclusive to Puterbaugh). “Everyone is looking for something new and different to create a unique flavor that will set their product apart from others,” Gardner says. Centennial, in particular, has experienced exceptionally high demand in the past year. And it’s not just limited to pro brewers. Chris Smith of Northern Brewer homebrew supply has observed a similar trend in the purchasing habits of NB’s customers. While traditional varieties such as Willamette, Tettnang, and East Kent Golding still have their place in traditional styles, hobby brewers are increasingly seeking out the multilayered flavors of such hops as Mosaic, Amarillo, and Simcoe. In fact, homebrew stores such as Northern Brewer often have difficulty keeping these varieties in stock. Smith has also witnessed a remarkable thirst for southern-hemisphere hops, which bring exotic flavors of tropical fruit, lemon pepper, and berries to the table. With Australian and New Zealand varieties in such high demand, hops from down under appear to enjoy a very optimistic future. When BridgePort IPA was released to the public in 1996, a beer with 50 IBUs was considered extreme, and aggressive late-hopping with Cascade and Chinook was avant garde. This beer, which took gold at the 1997 Great American Beer Festival for Classic English Pale Ale, is understated compared to what today’s craft brewers are doing with hops. She also notes the increased popularity of wet hops (unprocessed hops just off the bine) and says the farm enjoys supplying wet hops because it lets the brewer see the farm firsthand during harvest, Puterbaugh’s busiest time of year. But despite the current excitement over wet hops, Gardner says wet doesn’t trump dry because dry hops can be stored for long periods. Wet hops, on the other hand, must be used within six hours of cutting the bine. Just as our palates that were once challenged by a 50 IBU IPA have now learned to seek out Pliny the Elder, it seems likely that our insatiable demand for bigger, bolder, more intriguing hops flavors won’t abate anytime soon. The mechanics of getting those flavors from suppliers to consumers may evolve, and we’ll certainly enjoy new hops varieties from previously unknown growing regions. But as long as the demand exists, hops growers will undoubtedly be there to take down the bines, load them onto trucks, and send them off for picking.